I have been using this banana bread recipe for thirty years. It has amazing texture and flavor. And I know that you will agree that this recipe makes the very BEST banana bread. Make sure to check out my video at the end of the post to see just how easy it is to make the perfect banana bread! What do you do with a ripe banana or two? Make banana bread of course. And I have the BEST banana bread recipe. 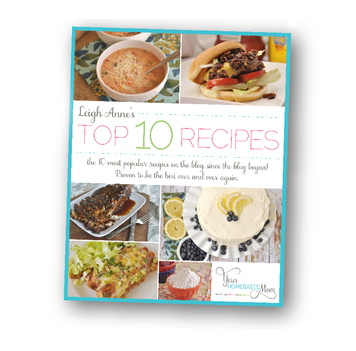 I can call it that because my maiden name is Best – so I guess every recipe I have could be called the BEST recipe. But seriously, this banana bread recipe is the BEST! I have made this banana bread for years. The recipe came from one of those little softcover recipe books you can buy in the grocery store line. Everyone I have ever made this bread for LOVES it and asks for the recipe. 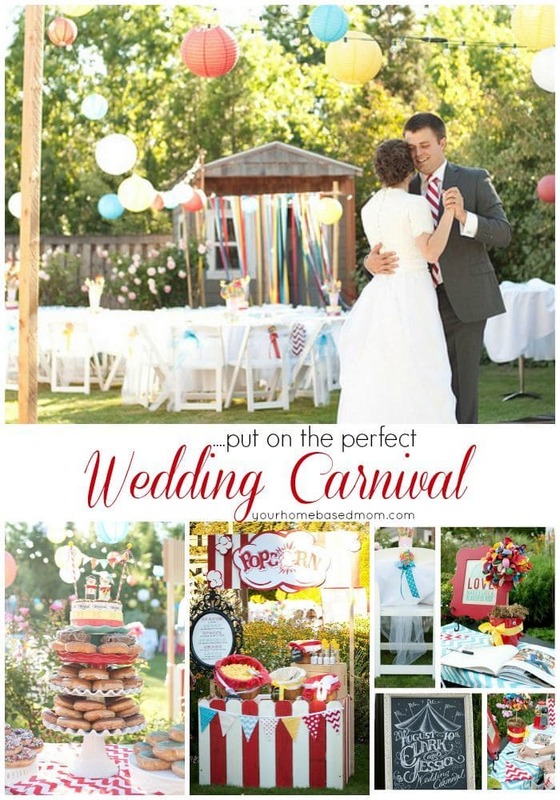 In fact, my friend Allison emailed me the other day asking for it and I promised her it would be on the blog this week. Last summer when my friend’s teenage daughter had ACL repair surgery the one thing she asked for after her surgery was my banana bread. Of course there was a warm loaf of banana bread for her when she got home from the hospital. So, if you have some ripe bananas on your counter you now know what to do with them and if you don’t have any – go buy some today! 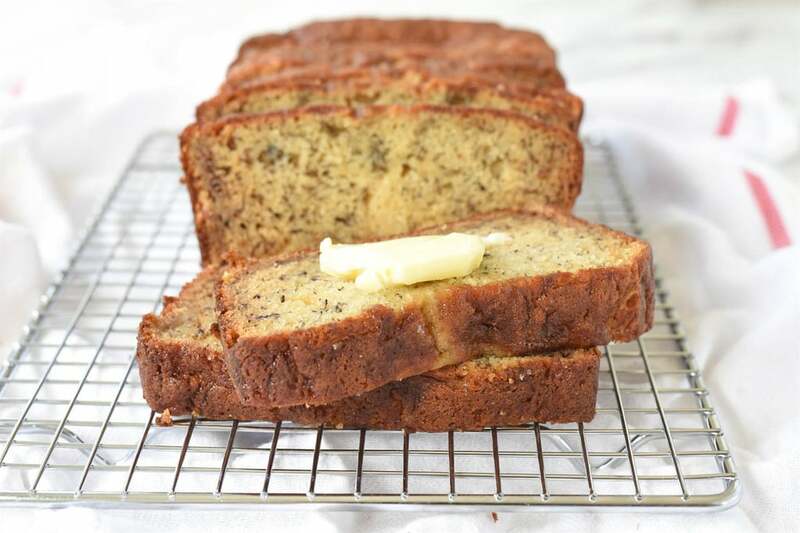 Do you eat your banana bread with or without butter? I’m a butter girl myself. This truly is the BEST banana bread and the recipe I've used for over thirty years! It has amazing texture and flavor. Grease and flour bottom of 9 x 5" loaf pan. In a large bowl, mix together sugar and oil. Add in eggs, banana, sour cream and vanilla. Blend well. Add in flour, baking soda and salt and stir until dry ingredients are moistened. Cool 5 minutes and remove from pan. Cool completely. Makes 1 loaf. Sounds yummy! I have everything but the sour cream, and not even plain or vanilla yogurt to substitute, so it will have to wait a few days. I substituted the sour cream with mascarpone cheese for a creamer taste and added oats and walnuts – I also balanced between white flour and whole wheat flour as well as white and brown sugar. Delicious !!! Love your changes- glad you liked it! Hey Leigh Anne…. k, I know what I’m doing with those black bananas on my counter when I get home tonight. I’m curious, have you ever added nuts or chocolate (or any other kind of) chips to the recipe? I am not a big fan of nuts in my baked goods but I’m sure they would be great. Chocolate chips is a great idea too. I recently saw a recipe for banana bread with white chocolate chips – yum! While in Florida a few weeks ago I had a salad that they put banana bread croutons on – they were delish. I am saving one of my small loaves to give it a try and make croutons out of. Happy baking!! I love the light color of the bread – that’s my preference with banana bread. I’m saving the recipe to try for sure! I just finished making banana bread – it literally came out of the oven 10 minutes ago. The recipe I have is nearly identical to yours – with the exception of three things (That’s nearly identical isn’t it LOL) Mine uses butter instead of oil, no sour cream and one less egg. I will have to make your next tiem and compare the two. Thanks so much!! Okay I had 3 small bananas waiting for banana bread. I have a recipe that I love – but it’s so fun to try new recipes. I missed the vanilla – but noticed before I put it into the over – so I used a nice to put drops of vanilla into each muffin tin and then stirred…we’ll see how it comes out :-). I don’t have any loaf pans, instead I have a DeMarle muffin pan. Which if you have never tryed the DeMarle products, they are FABULOUS for cooking. I’ll let you know how they turn out. OK, I finally made it. The recipe has been sitting on our counter for a month now and I have to tell you, it was worth the wait. It is really really good! I would like to try it using butter (I missed that taste from this recipe) but other than that – it is absolutely fabulous! The. Most. Amazing. Bread. Ever. 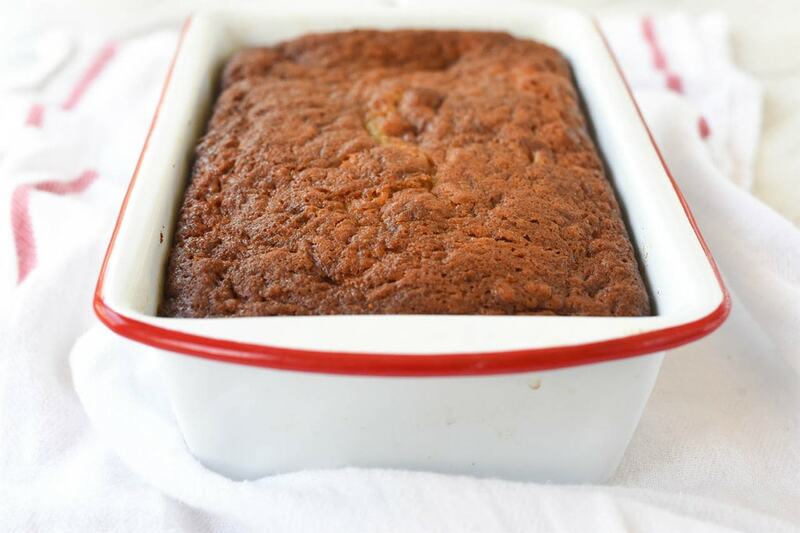 I tried your banana bread last night and it tastes absolutely wonderful and is so moist! I have two questions, though. Do you have any suggestions on how to freeze bananas? Also, what type of bread pan do you use? I used a glass pan and it browned the bread a little too much although I took it out of the oven as soon as a toothpick came out clean. Any suggestions? Either mash your bananas or leave them whole and freeze them in a zip lock freezer bag. They freeze well. When I freeze bananas I just peel them and then put them in a ziploc bag and toss in the freezer. I use metal bread pans. The instructions say to grease and flour only the bottom of my loaf pan, which I did. However, one of the corner sides of my loaf stuck to my metal loaf pan when I flipped the pan over to remove the bread. This happen even after I used a sharp kitchen knife to loosen all sides for the pan. Therefore, my advice would be to grease and flour the bottom and all sides of your loaf pan. By far one of my most favorite treats of all time! I’ll be making this recipe within the next few days and forwarding to coworkers. I made this last night. It was so good!! My husband and I couldn’t even wait, we each had a warm slice with butter right out of the oven:) Can’t wait to gobble the entire loaf down! Thanks for another great recipe!! It’s a two tumbs up recipe. Ohmigosh was it fantastic! My family loved it. Thanks for posting this one. It’s a new fave of ours. I made this recipe but doubled it as I had several ripe bananas – oh my, how moist and delicious! This is a keeper! I made this recipe for Banana Bread the other day and it is FANTASTIC! Moist and delicious!! My husband loved it and he didn’t even know it had sour cream in it, which he does not care for at all. He didn’t ask, I didn’t tell. The loaf was gone by the next day! 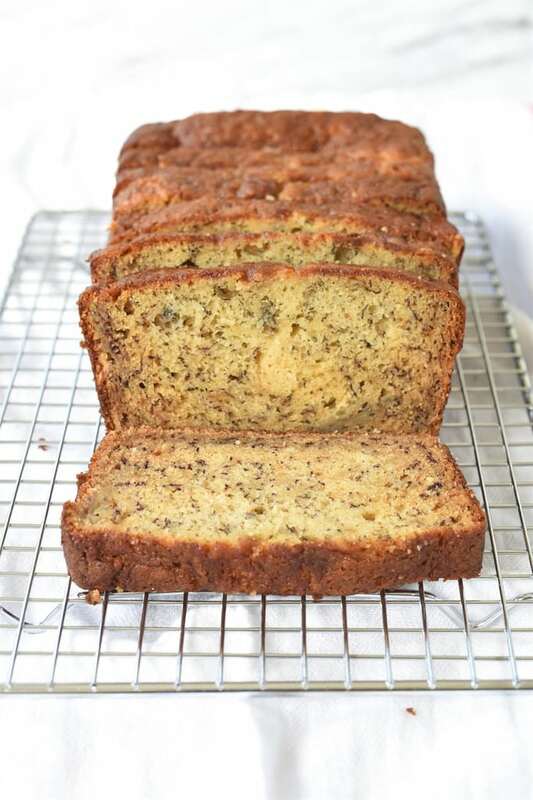 Thanks for this Sour Cream Banana Bread recipe! GREAT! This is great banana bread,I should have known. I’ve tried several of your recipes and liked them all.I love your blog! My daughter ,her friend and I made the felt flowers at Christmas and gave as gifts we loved those too. I have made this loaf a half dozen times so far, we love it. The batter itself tastes so darn good my husband can’t wait to lick the bowl. Thanks for the recipe! I substituted brown sugar for regular sugar, since I was out and we made a loaf plus mini-muffins out of it. Turned out great! I love the idea of coating the pan with cinnamon/sugar and adding cinnamon to the batter! I can’t wait to try that! Thanks for sharing. I am so glad you enjoyed the recipe. What or I should say how did you make the cinammon/sugar mixture? How did you make it stick to the sides? Thanks! Not sure what you mean – there is no cinnamon sugar mixture in this recipe. For the gal that asked how to apply cinnamon sugar to the pan as a person suggested …After you grease the loaf pan then you sprinkle the cinnamon sugar in the pan and shake it around bottom and up the sides as you tilt the pan . Shake out excess as you would with flour dusting . I have been looking for the perfect banana bread recipe and I found it!!! I baked it lst night and couldnot stop eating it. So glad you liked it! It is a winner!! I am making this recipe again and I had to write to say how much my family enjoys it. The only thing I did differently was replace 1/2 cup of the flour with whole wheat flour. My 6 y.o. is so picky, but LOVES this banana bread! It certainly is the BEST! I made your banana bread recipe this afternoon and it was delicious. However, mine was dark….why is mine dark and yours looks so light colored?????? Glad you enjoyed it. Wondering if maybe the kind of pan you bake it in may effect it – I used metal. Did you maybe use glass?? No, I used metal…could I have baked it too long? Possibly – was it dried out at all. It is a very moist bread. It was moist…just have to try it again. It was delicious. Will watch my baking time and also not stir the dry ingredients as much. I doubled the recipe and made a loaf of bread and 12 muffins and I must say the best banana bread I’ve ever made! Delicious flavor and super moist! Bravo! So glad you enjoyed it. I made a couple of loaves myself this week. I made this today using coconut oil it was so good! I usually use a butter based banana bread recipe (from Land O Lakes little cookbook from the checkout) and I really liked the butter flavor, but I definitely like this one better. I couldn’t taste the coconut either. I did make a brown sugar topping that sunk into the bread but that made it that much better! This is the recipe I am using from now on! So glad you liked it – it really is a winner! Just made your banana bread and it was so good. I used butter in place of oil, added 1/2 cup chopped pecans and it turned out really moist and delicious. Thank you so much for the recipe! Good to know it works well with butter. Love the idea of the pecans too. Wow! This recipe was fantastic! So simple and the end product is amazing! There’s a local blogger “celeb” where I am from who bakes and sells a fantastic banana bread in many of our local coffee shops and I believe even some of our grocery stores carry her product as well now. Her’s is seriously world famous now and is “to die for banana bread”. I’ve been craving it for the last few days and got inspired to find one that comes close so I can bake my own. Oddly, I never liked banana bread until I tried hers simply because I always found it to be dry (hers is super moist). I came across this recipe and decided to give it a go and am so happy I did! It came out very moist and nearly perfect (I forgot that I wanted to add chocolate chips until it was too late). I used olive oil (I’m an addict) for my oil and everything else was the same (though I also added a hint of cinnamon). Glad I tried this one out. Amazing!!! Next time will add in some chocolate chips (or peanut butter chips) and possibly some walnuts or pecans. 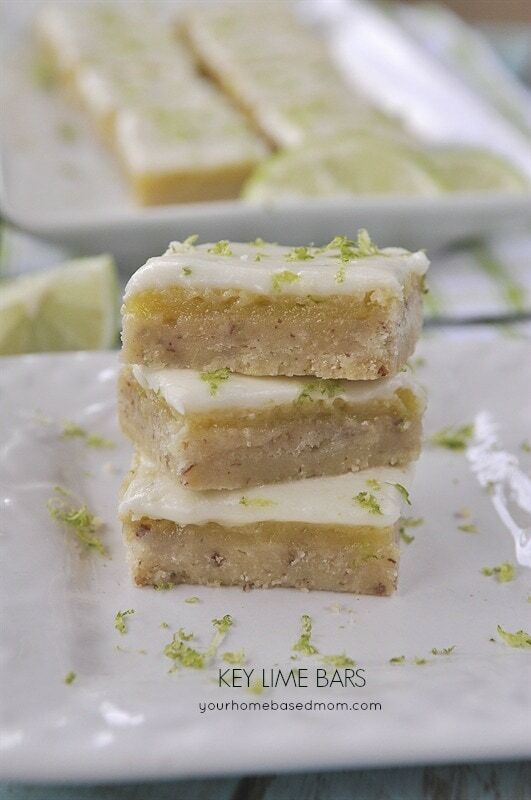 Thanks so much for posting this wonderful recipe with us! 🙂 Truly spectacular! I used to have a recipe for banana bread which used sour cream and butter, with cardamom and other spices. The pans were buttered and then “floured” with cinnamon and sugar. Not familiar with your version but give this one a try and see what you think! These are amazing!! I have now made them twice, and they barely last in this house! I made them into muffins, and lightly greased the papers and then sprinkled cinnamon and sugar, wow! So very good! They only take 20 minutes to cook so they are easy to do in the morning! Thanks so much for sharing! love the idea of doing them as a muffin. So glad you enjoy the recipe. So glad you found it again! It is a keeper. Can someone tell me how much butter they used to replace the oil? Sorry Jodi but I don’t know. I have never replaced the oil with butter. Just made these in mini loaf size, to give out for Thanksgiving. Absolutely delicious & moist. Thank you for another wonderful recipe. My mouth is watering just reading these posts! I am a visual person, so when I want to try a new dish I simply type it into Google and hit images. My eyes targeted your bread immediately for its light color and clear moisture! Upon reading the comments I knew I HAD to try this. Lucky for me, I have 4 brownish bananas on the counter. Hit “print”, run to printer, start baking! My 16 year old daughter will love this for a snack after school. That is, if I can keep myself from eating it. Off to cook now …! Thank you! Hope you love it as much as we do!!! 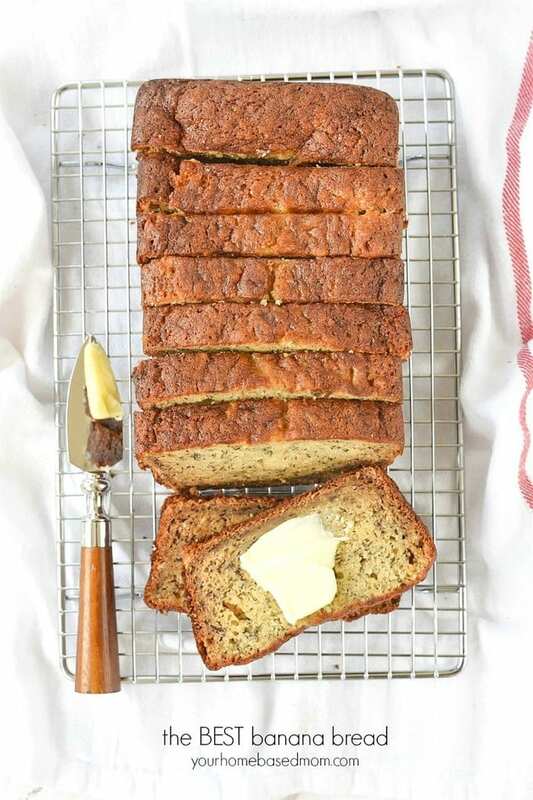 Your banana bread recipe looks amazing! I love when recipes have sour cream in them, it makes them nice and moist! I was wondering how long do you beat together the sugar and oil for? I’m always really confused when recipes call for this step? How long did you beat the sugar and oil for? Will the banana bread not turn out if you beat that step for to long? Also at this step when you beat the sugar and oil, did you use a hand mixer? Was the mixture gritty, like can you feel the sugar when you rub it with your fingers or does it have to be completely smooth? I’m new at baking and I can’t wait to try your recipe! I’m planning on making it this Sunday! Thank you! Jazzmin, I just beat the sugar and oil together until they are combined. I use my Kitchen Aid to mix them together. I found this on Pinterest ! I followed the the whole recipie except I didn’t have sour cream, I had a bunch of plain Greek yogurt… I used that and it came out fantastic! Thank you for this! Erika, SO glad you loved the recipe too! My daughter made this recipe last night. She doubled it and made muffins! Divine! Love your recipes. Made this-love it!!! Turned out so moist. Will be making this again. So glad you loved it too! It really is the best banana bread ever! Love that you think it is the best too!!! Yum! I have made this at least 10 times now! I make it weekly and it freezes beautifully too. I had to say thank you for the best banana bread recipe ever!!! Super moist and delicious! I add an extra banana, if I don’t have sour cream use yogurt, I’ve used spelt & wholewheat flour, maple syrup for sweetner when I’ve run out of sugar. Used mini bread tins, muffin tins & regular loaf. Very adaptable. Thanks again, I’ll be using this recipe forever! Tamara – thanks so much for taking the time to let me know. Love that you love it too! Thanks for the tip on using the extra banana if I’m out of sour cream. I just made your banana bread because I can’t find the one I have used for over 3o years !!!! I have to say it was delicious !! I did use butter instead of the oil…I melted the same amount of butter you have for the oil…let it cool and then finished the recipe. It was awesome….I had it a little warm with a cup of tea..right now it is snowing here in upstate new York and have 5 inches of snow so far ! They didn’t expect this much!!!! How nice for me to have this lovely bread today !!!! So glad you enjoyed it. Enjoy that snow!! Wow. The last banana bread recipe i tried was lackluster. Not very moist, and didn’t have a lot of flavor. Today I decided to try out this recipe, and I’m super happy that I did. I used a glass pan, and had to leave it in the oven for about 1 hour because a little bit of it was uncooked. I also decided last minute to put walnuts in it, so once I had it in the pan, I dumped walnuts in and stirred it with a fork. I tried a piece and thought it was pretty amazing, as did my boyfriend. My dad is a little picky when it comes to desserts, but he gave this one a thumbs up as well. I currently have a second batch (plain) in the oven, and I’m looking forward to taking it to work with me tonight. I had 6 ripe bananas, and the recipe takes 2, so I’m making walnut, plain, and chocolate chip bread. Thank you for the great recipe! I will be saving this one for future use, it’s definitely a keeper. Kona, Glad you loved it too. It really is the BEST Banana Bread! Yes I do agree!! Throw out all other recipes! This is by far the best ever! It seems from all the comments people have been tweeking it in one way or another. I, too did a little adjustment. Instead of oil or butter I substituted same amount of applesauce. Wow! It was incredible without the extra fat!! Super moist and delicious. But BEWARE!! You might eat the whole loaf! Thanks for this recipe. This is absolutely DELICIOUS!! Thank you soo much for sharing this recipe!! 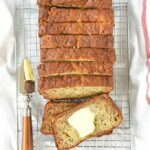 I’ve been finding for so long a good flavourful recipe for Banana Bread! When I saw this I thought it looked too simple but oh my lord! It is divine! I’m not exaggerating! Thank you again! Try this recipe out! You don’t regret it! You don’t know how much I love to read comments like yours!!! Thanks so much for letting me know. i love the first blog post date…2008!! I love the first blog post date…2008! I make this in a bowl by hand. Just beat the sugar and oil together and continue adding the wet ingredients. I then add the salt, soda and stir in the flour. Do not over mix the flour, just gently stir it into the wet ingredients. Very good banana bread! Dalene, I love hearing that and I’m sure your neighbors love you for sharing!! So glad you love it too – it is definitely a favorite at our house. This recipe popped up in my FB feed recently and with a half-dozen extremely brown bananas in my fruit bowl, the timing was perfect to give it a try. Absolutely delicious! I added a 1/2 tsp Almond extract since I sometimes find banana bread a bit bland. Not sure how much of a difference it made, but it sure was good! 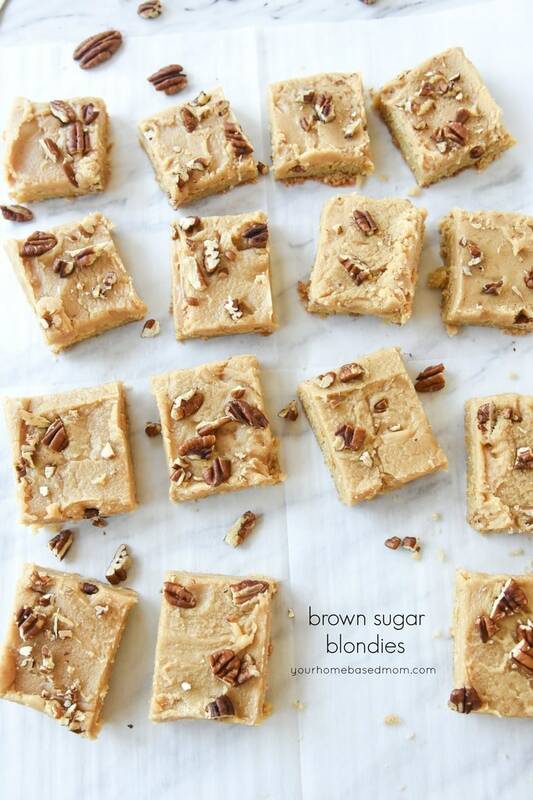 Love the idea of adding some almond extract to it! Is there a substitute for the sour cream. My son has a dairy allergy. You could try apple sauce. I have never done it but it might work. You want something to add some moisture. Use greek yogurt instead of sour cream. Applesauce is a good replacement for the fat. What do you mean by sour cream? Kelvin, I am assuming you are not from the US. Sour cream is easily found in the dairy section of the store. Sour cream is a dairy product obtained by fermenting regular cream with certain kinds of lactic acid bacteria. I love the idea of adding almond and cinnamon sugar – yummy! I will have to try it. Hi! Just wondering if this recipe will work for muffins? I used strawberry banana yogurt light instead of sour cream this time and it is Awesome!!! What size pan? I’m constantly seeing recipes that say, ‘pour in a pan’. We’ll great, what size pan? It makes a huge difference. Donna, I use a standard 9 x 4 bread pan. Why do the instructions say to store in the refrigerator? Is this a must ? If you plan on keeping it for longer than a couple of days it will hold better if it is refrigerated. Not required though. Gawh! This sounds amazing and just what I’ve been craving! Only downfall is it’s 10 o’clock at night and almost time for bed……setting my alarm to get up early and make this recipe!